The premium starter kit includes 2 Registry Identification Cards. These cards provide all the information clearly for your Service Dog, Therapy Dog, or Emotional Support Dog on one easy to read, high quality, laminated ID card. You will also receive a FREE entry to our online registry database which can be validated from any smart phone, tablet, or computer. The Engraved Aluminum Dog Badge is anodized light-weight aluminum and is laser engraved on both sides. The badge comes with an attached S-hook which can be clamped shut after attaching it to the dog's vest, your bag, or wheelchair. 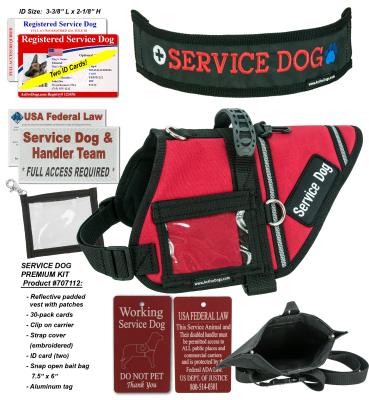 Service Dog: On the front is the text: “Working Service Dog, DO NOT PET, Thank you”, along with a graphic of a vested service dog. On the back is the ADA Federal Law and access permitted statement. Emotional Support Animal: On the front is the text: “Emotional Support Animal, Please Do Not Pet Me”, along with a graphic of a vested dog. On the back is a statement about traveling access and housing protection for emotional support animals. Therapy Dog: On the front is the text: “Therapy Dog, Please Ask To Pet Me”, along with a graphic of a vested dog. On the back is a statement about what therapy dogs do.